The colorful Japanese woodblock prints (hanga) that we see today are the culmination of centuries of development. Woodblock printing was originally developed in China in the fourth century, AD, and came to Japan with the arrival of Chinese and Korean Buddhist missionaries several hundred years later. In Japan they were soon used to create simple Buddhist charms (sayings). Their use was expanded later, in 1088, to print Buddhist scriptural narratives. Thus, in Japan the use of woodblocks printing was initially confined to temples and monasteries. It was not part of art and culture that flourished in this period. A long period of feudal conflict, warfare and unrest emerged at the beginning of the thirteenth century. A new military class of Samurai had arisen, and the Imperial court was unable to control these independent warlords in outlying regions. Rivalry over land and power led to centuries of military conflict and civil war. But a much more subtle revolution was also underway. Trade and commerce fueled the rise of a powerful mercantile class. The very nature of power was shifting away from a feudal land based economy supported by the force of arms. Around 1600 the long period of civil war ended with Tokugawa consolidation of power, and peace allowed the arts to again flourish. As samurai warlords settled into their landed estates, they used artists and craftsman to decorate their homes. But the mercantile class in Kyoto and elsewhere, who largely had funded the wars, had different tastes, and their power had grown to rival, if not surpass, that of the Samurai. They commissioned non-traditional pictures, such as pretty courtesans and women. This was the beginning of an important artistic class schism which led to the development of woodblock prints as an art form. The art form then received an important boost when the first Tokugawa Shogun, Ieyasu Tokugawa (1542-1616), supported book production and helped in the establishment of an arts center for arts and crafts. Soon after simple black and white woodblock prints were incorporated into books. By the mid-1600's color had appeared. Edo was the new administrative, political and commercial capital whose citizens were cut off from the traditional arts and the imperial court centered in Kyoto. A middle class developed. The merchants class preferred more down-to-earth themes reflecting their own lifestyle. They attended the Kabuki (meaning fashionable) theater while the Samurai class patronized the more traditional Noh theater. Then in 1657, a raging fire destroyed most of Edo and in its wake a new form of cheap decoration, bought from publishers and street vendors, flourished: stand along woodblock prints. Woodblock prints were cheap and could be used to brighten screens and walls. They were bought from street vendors and from publishing houses. Hanga prints soon blossomed into intricate and rich multicolor compositions illustrating the exotic Edo-period urban lifestyle known as the "Floating World," or Ukiyo-e (uu-kee-yue-eh), a name by which this style of prints became known. Inspired by forms of entertainment patroned by the powerful Edo mercantile class, Ukiyo-e prints became the Hollywood posters, pin-ups and erotica of the day. They portrayed the arts and Kabuki theater, actors, courtesans, beautiful women, tea houses and brothels -- all that comprised the fleeting moment of beauty. When internal travel restrictions were lifted in the 1820's, a domestic tourist market also developed. 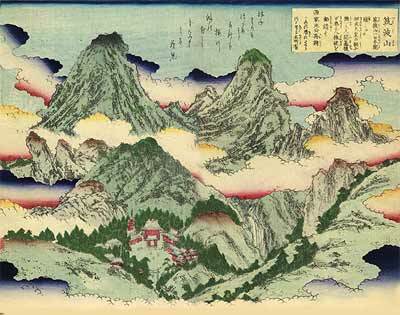 Interest blossomed in landscapes, such as scenes of Mount Fuji, seascapes and landmarks. History and fictitious-historical stories became a favorite subject in the Meiji era (the modern era from 1868-1912). Depicted were mythical, historic figures, heroic samurai legends and great acts of valor, battle scenes and sumo wrestling. Many were violent in nature, others done with humor, as tongue-in cheek parodies of classical art forms (kano), while others were so romanticized that prints included inscriptions informing the viewer of the scenes portrayed. In 1853, the closed society of Japan was forcefully opened by American gunboats. Soon afterward, Western trade with Japan began. In the port city of Yokahama a market for woodblock prints developed among foreign visitors. The earliest prints were in black and white, but soon the public demanded color artwork. By the 1750s, hand coloring had evolved into sophisticated full-color printing. Through an intricate process, artists' drawings were translated by a master woodcutter and assistants into a master cherry or other hard fine textured wood panel carved in relief. A black and white print of the design was made from the master pane which was used to create separate woodblocks, one for each color to appear in the print. These were ultimately used to print the design in multiple colors. Technical refinements allowing precise registration allowed simple four-color prints to evolve into those with up to ten or twelve colors. The final composition was entrusted to a master artisan for the multi-block impression process of finished printing. Many believe the myth that Europeans first became aware of this unique art form because woodblock prints were used as wrappings on items arriving in Europe from the Orient. In truth it was a French engraver who upon coming across a wooblock print recognized its importance, and showed it to friends. Later a shop was opened selling Japanese objects, including woodblock prints. They soon became much in demand because of their sweeping compositions, which were rich in color, designs and textures portrayed without shadow. They also caught the interest of many Impressionists. Monet, Degas, Van Gogh who were influenced by this genre of Japanese art. Prints by Henri Toulouse-Lautrec, for example, have a Japanese woodblock print quality, and Paul Gauguin's oil paintings of the South Seas use a stylized Japanese woodblock method, using flat areas of bold color without perspective. Today in the West, some woodblock prints, such as Fuji in Clear Weather and The Great Wave off Kanagawa by Hokusai and The Sudden Shower at Ohashi Bridge by Hiroshige are as recognizable as works by Picasso or Renoir. Unfortunately, contact with the West also had a negative effect on the popularity of the woodblock art form. The Japanese developed an absorbing interest in all things western, especially science and technology. Photography captured the publics attention. Woodblock prints could not compete. Only a few artists struggled to keep their woodblock print art alive, and the art form never regained the popularity it once held.